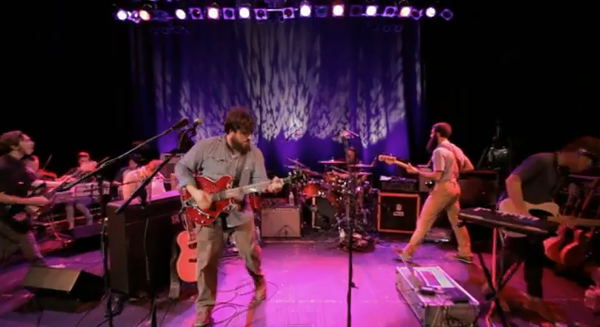 On May 9th of last year, Prog-rock outfit The Dear Hunter played a one-off gig at Somerville Theater just outside Boston. The special engagement was the one and only time the band played 2011′s nine-EP, 36-song compilation The Color Spectrum in its sequential entirety. Of course, you don’t let a sold-out event like that go undocumented, so HD cameras were on hand to capture the affair on film, and now The Color Spectrum Live DVD is set for release on March 12th. As a taste of the concert film, the band has selected the footage of “Home” from the WhiteEP as the song’s official video. The video showcases Casey Crescenzo’s enormous vocal strengths, bassist Nick Sollecito enormous facial hair, and the support of both The Boston String Party on strings and the Somerville Theater crowd on backing vocals. Check it out just ahead. The Color Spectrum Live features the over three-hour performance in its entirety, including an appearance by Manchester Orchestra’s Andy Hull. Pre-orders begin next week through thedearhunter.com. The Dear Hunter have plans for a new album this year (here’s hoping for Act IV) and a national headlining tour with stops at Australia’s Soundwave festival and South by Southwest along the way. Keep it here for more info as it’s revealed.